Methanol is a primary raw material for the chemical industry. It is manufactured in large quantities (about 76.3 million tons of China in 2015) as an intermediate for the production of a variety of chemicals including formaldehyde, methyl tert-butyl ether, and acetic acid [1, 2]. The toxicity of methanol is frequently quoted as a hindrance for its use. Methanol is highly toxic only when ingested in larger amounts (30–100 mL), causing blindness and eventually death [3, 4, 5, 6]. Therefore, the use and dispensing of methanol as a general fuel is not expected to cause any significant safety problems. Commercially, methanol is produced from natural gas or coal via syngas, mainly containing CO and H2 along with a small amount of CO2. The potential use of CO2, the most important greenhouse gas, as an alternative feedstock replacing CO in the methanol production has received attention as an effective way of CO2 utilization. Under proper conditions, methanol made from atmospheric CO2 by its reaction with hydrogen is regarded as the “most economical way” after oil and gas . Therefore, the study on the synthesis of methanol has promise. The methanol synthesis tower is the core equipment in the methanol plant. It is not only expensive, but dangerous if accidents occur. Therefore, the methanol synthesis tower needs to be regularly inspected. The failed elbow in the methanol synthesis tower in this investigation was exposed to the air. And the working medium in this tube was deaerated water. The operating pressure and the operating temperature of the tube are 3.5 MPa and 140 °C, respectively. After 8 years of service, cracks were detected in the middle section of the tube. Cracks appeared again in the vicinity of the welding area after the repair welding. 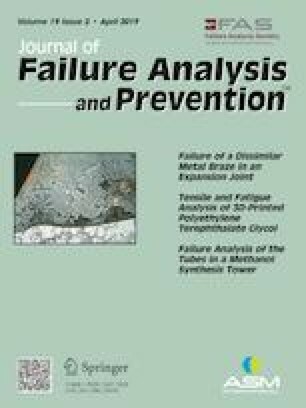 Through detailed investigation of the failed elbow in the methanol synthesis tower, this study aimed to find the failure cause of the elbow, and put forward the corresponding preventive measures. The failure analysis was performed on the failed elbow, especially to the weld in the middle of elbow, as cracks appeared on or near the weld. To further examine the crack morphology, a sample with cracks was excised from the tube. The metallography samples were prepared by using standard metallographic techniques and etched electrolytically with 10% oxalic acid solution. In order to study the cracking mechanism, the elbow was excised for fractography study along the cracks. The microstructure was analyzed by optical microscope and scanning electron microscope (SEM) equipped with an energy-dispersive x-ray spectrometer (EDX). The chemical composition of the failed elbow was analyzed by a 725ES Agilent spectrometer. The tensile mechanical properties were measured using an INSTRON 8021 tensile testing machine. 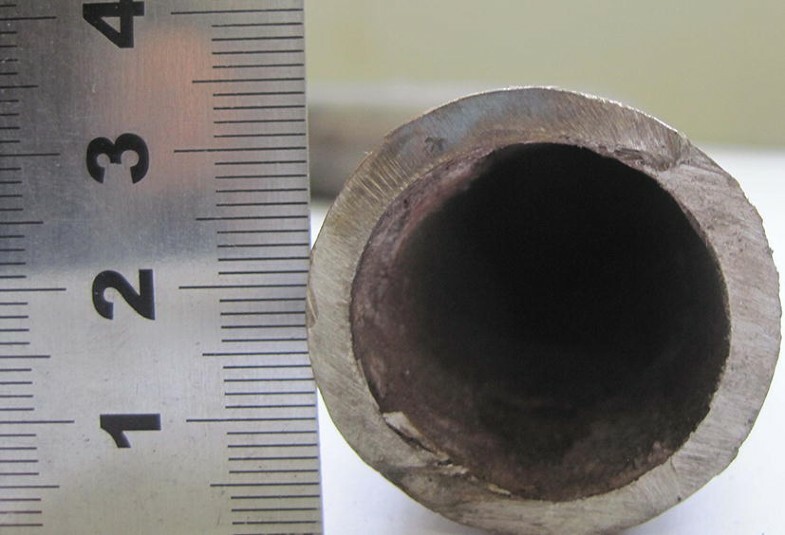 The external surface of the failed elbow from the methanol synthesis tower was smooth and exhibited no obvious signs of corrosion, as shown in Fig. 1a. There were welded sections in the middle of the failed elbow (Fig. 1b). According to the information from the plant, cracking was detected in the middle of the elbow. After repair welding, cracking was present again in the vicinity of the welding area. The position of the crack was in the minimum of the curvature radius of the elbow. The cross section of the elbow is presented in Fig. 2. A thick layer of deposits was present on the inner wall surface of the elbow, and the wall thickness of the tube did not appear to be even. The scale layer from the inner wall of the tube exhibited a reddish brown coloration. In order to determine the potential causes for the cracking of the elbow in the methanol synthesis tower, sampling and analysis of the welding section of the elbow were carried out. Two small pieces of specimens, as shown in Fig. 3, were excised from the welding segments of the elbow, and labeled as Sample I and Sample II, respectively. Welded part of the pipe was not covered with the circumferential direction. Sample I corresponded to the welded section, and Sample II was excised from a non-welded section. Thick and loose scale layers were present on the inner surface of the elbow. 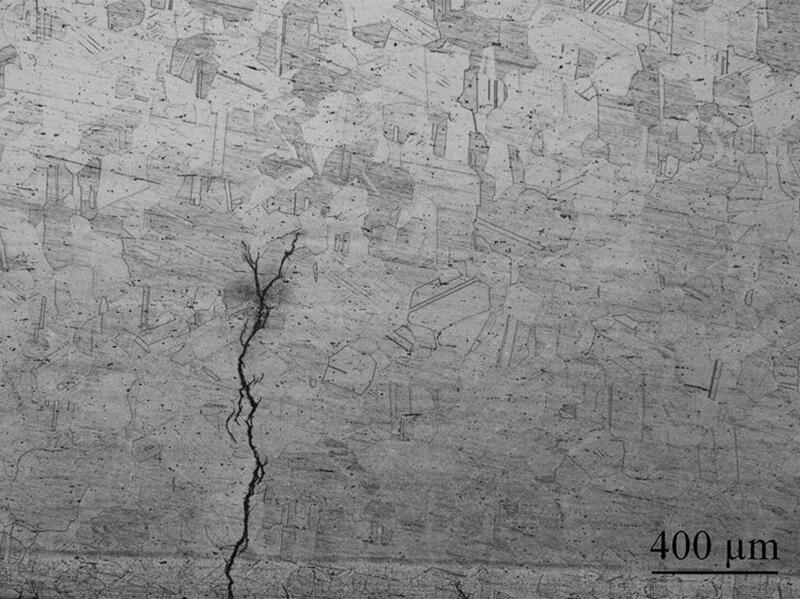 On the inner wall of the Sample I, a circumferential crack was visible, and the crack was relatively straight. The position of cracking detected on the inner wall corresponded to that of repair weld. The cracking direction was the same as that of the weld. 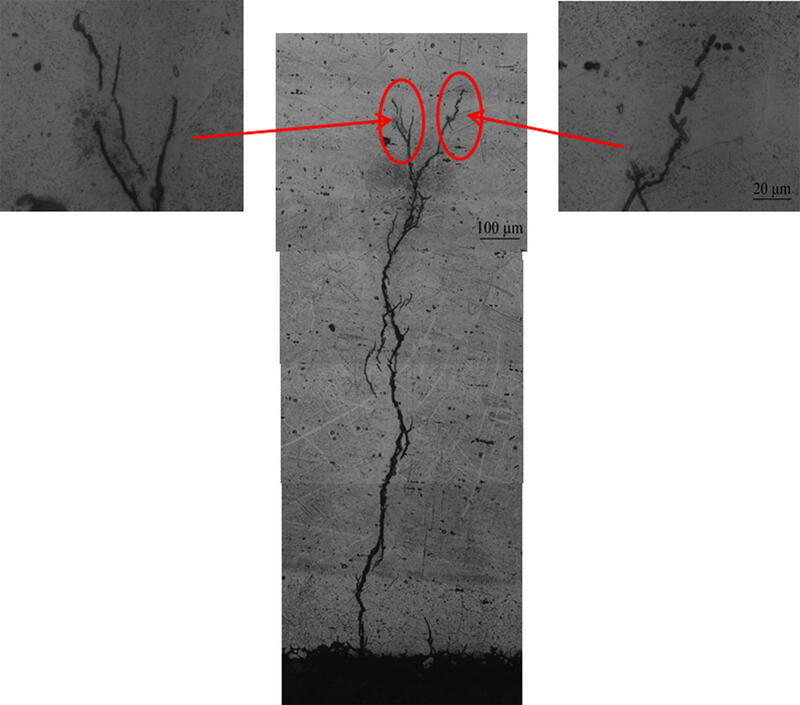 On the inner wall of the Sample II, it could be seen that there were several cracks in the cross section, two of which had not yet penetrated from the inner wall to the outer wall. It was therefore concluded that the direction of crack initiation was from the inner wall of the tube to the outer wall of the tube. The inner surface of the elbow was therefore the main research object in the following study. 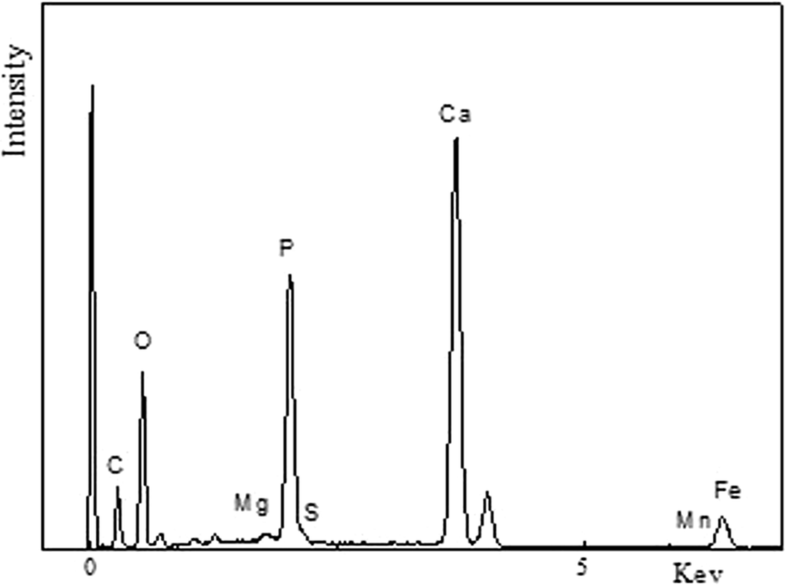 The chemical composition of the failed elbow is shown in Table 1. It can be seen that the composition of the matrix material of the tube does not meet the requirements of the relevant standards, of which the content of Mo is 0.27, far less than the standard in the range of 2.00–3.00. The reduction of Mo will decrease the corrosion resistance of austenitic stainless steel, especially the pitting corrosion resistance [8, 9, 10, 11, 12]. This is consistent with the pits and corrosion marks present on the inner wall. Mechanical testing specimens were machined in a region away from the weld area of the failed elbow, in order to avoid the effects of the cracked region. The tensile properties are shown in Table 2. The results indicated that tensile strength and yield strength met the standard requirement, while the elongation did not meet the minimum requirement. Acetone solution was used to clean the Sample I and Sample II specimens with ultrasonic washer, and then, a solvent softened acetate strip was applied to remove the impurities on the surface of the two pieces. The surface texture of the two samples was then analyzed via scanning electron microscope, as shown in Fig. 4. There were several obvious cracks on the inner wall surface of Sample I, and a thick scale layer was also present. The cracks initiated and propagated under the scale layer. There were no obvious cracks on the inner wall surface of Sample II, only a layer of rugged scale was present. EDS results showed that the scale layer contained a substantial amount of oxygen, calcium, phosphorus, iron, and also a small amount of sulfur, manganese, sodium, magnesium, etc., as shown in Fig. 5. The crack on the inner wall surface was opened to further examine the fracture surface. Loose debris on the fracture surfaces were removed by ultrasonic cleaning and acetate process. 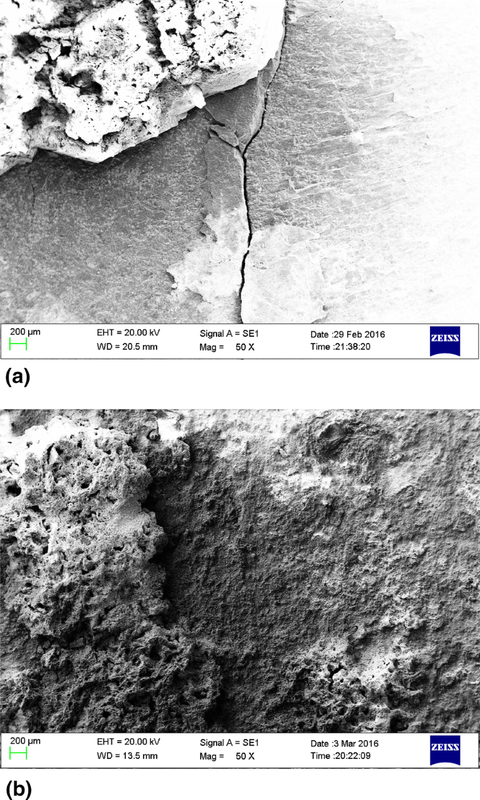 A thick scale and secondary cracks were present on the fractured surface as shown in Fig. 6a. The EDS results of the crack tip, as shown in Fig. 6b, indicated that there was a large amount of oxygen. Sulfur and chlorine was also detected at the crack tip, in addition to the inherent elements of stainless steel. Compared with the scale composition on the inner wall surface, not only oxygen and sulfur was found, but also chlorine. Chlorine in the form of chlorides is known to be corrosive to steel in a moist, slightly acidic environment. Small samples for the metallographic study were excised from the Sample I and Sample II pieces, and the locations of these specimens are shown in Fig. 3. There were two obvious large cracks from Sample I, whereas none had been detected on Sample II. The cross section of samples is shown in Fig. 7. It was determined that the cracks started from the inner wall of the elbow, and extended to the external wall along the wall thickness direction. No obvious corrosion traces and cracks were observed near the external wall. And the crack shows obvious bifurcation phenomenon or branching. During the propagation process, applied stress redistributed due to the changes of applied load, and the effect of adjacent cracks, material defects, residual stress etc, caused the change of the stress state in the front of the crack. This change made the cracks change the direction of their movement continually. It is also because of the changing direction of movement of the crack, the corresponding position on the fracture surface tends to form a step. 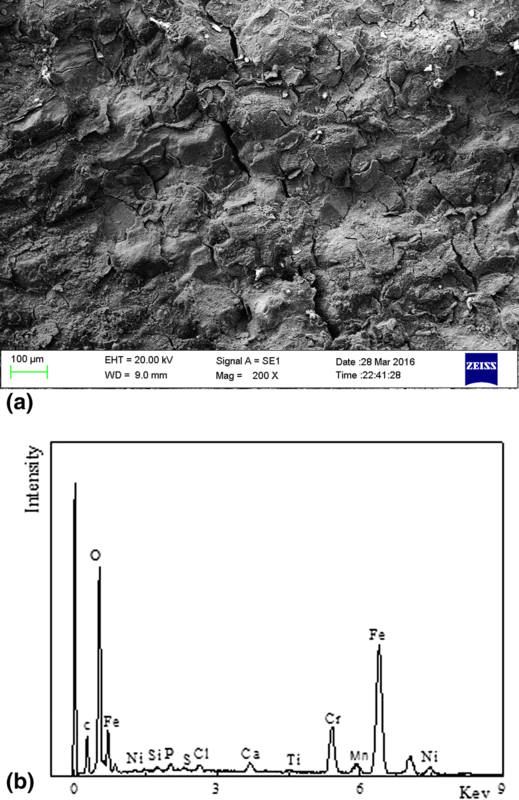 Obvious intergranular corrosion could be found on near inner wall surface, and the depth was about 300–400 μm, as shown in Fig. 8. In addition, pitting corrosion was present on the inner wall, the depth of the pits was about 50–100 μm. Most of the cracks started from these pits. And there were transgranular cracks and intergranular cracks which could be seen from the crack propagation path. Most cracks began to progress intergranularly near the inner wall and then propagated transgranularly to the outer wall. The microstructure of the failed tube is illustrated in Fig. 9. Some annealing twins were present in the austenitic matrix. In addition, a small amount of carbide precipitated within the grains and along the grain boundaries. In the cracked area, the microstructure also consisted of austenite, but the grain size was smaller relative to the outer wall of the tube. The cracks were initially detected at the position with the minimum curvature radius. After repair welding, cracks appeared again. Residual stress can be introduced by the bending process and affected by manufacturing and heat treatment techniques [13, 14]. The residual welding stress also cannot be ignored. 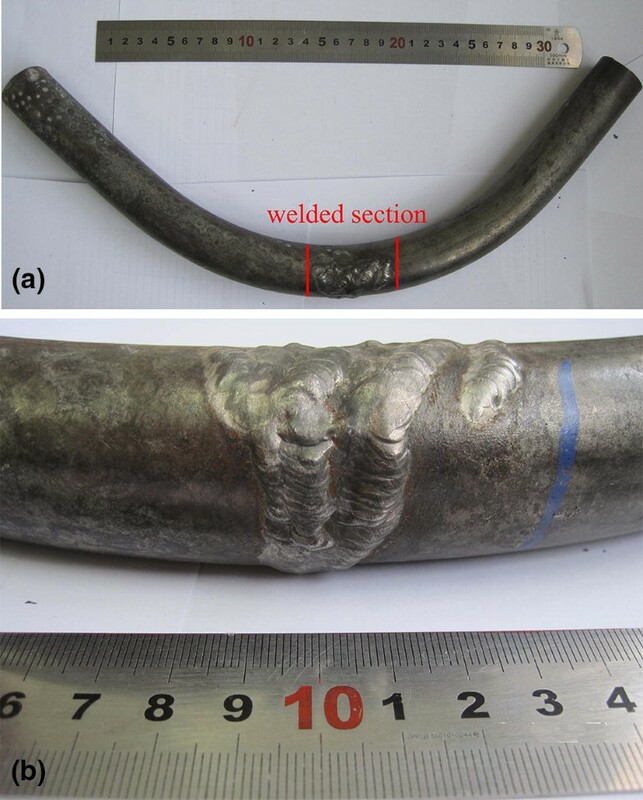 The combined effect of transverse residual welding stress and the stress resulting from bending is one of the causes of tube failure. The lower elongation of elbow comparing with the standards makes the material brittle, which could cause the initial cracking before repair welding and further influence the cracking resistance of elbow. The existence of sulfur and chlorine constitutes the corrosion environment, which are key factors that induce stress corrosion cracking in austenitic stainless steels . Chlorine and sulfur could have been introduced by the process of pickling and passivation, and the incomplete water treatment. 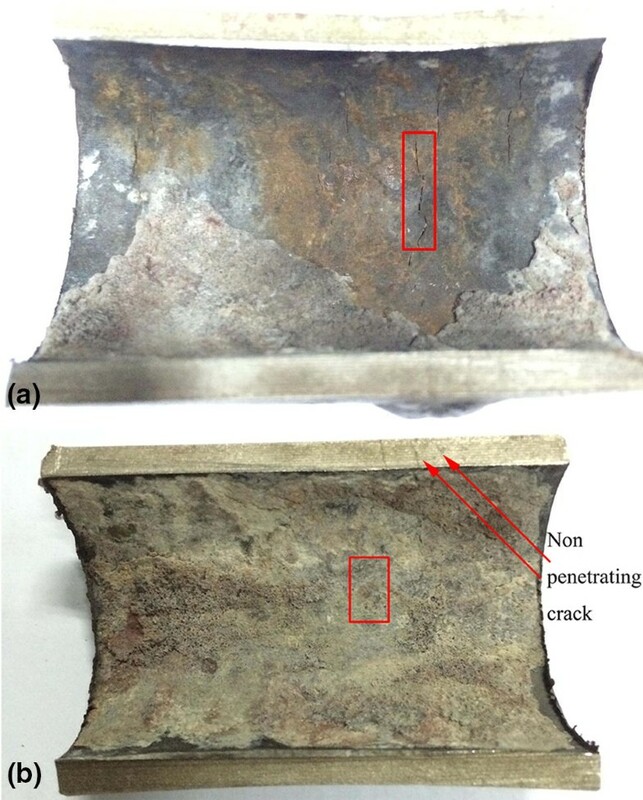 They had a severe corrosive effect on austenitic stainless steels, particularly under tensile stress, which significantly accelerates crack propagation [15, 16]. The elbow developed cracks when subjected to sustained external and residual stress with a corrosive environment. The materials are also susceptible to the corrosion environment. These are the three legs for stress corrosion cracking (SCC): a certain corrosive environment, special materials susceptible to corrosive environments, and sustained tensile stresses . The cracks propagated either in an intergranular or transgranular mode, which is one of the characterizations of SCC. The low content of molybdenum in the elbow decreased the pitting corrosion resistance of austenitic stainless steel. Coupling with the corrosion environment could result in the formation of corrosion pits, which are the cracking source. In order to prevent the cracking of elbow in the methanol synthetic tower, the quality of the material should be ensured, including the elemental composition and the corresponding mechanical properties. After the pickling and passivation treatment, cleaning thoroughly is needed. The existence of chlorine should be avoided with this kind of material. Repair welds should be avoided, or stress relief annealing should be conducted timely after repair welding. The failed elbow in the methanol synthesis tower was analyzed to find the failure causes. Cracking was detected before and after the repair welding in the position at the smallest curvature radius of the tube. The failed elbow cracked in the vicinity of the weld. The cracking initiated at the inner wall of the tube and then propagated along the circumferential direction of the tube. The cracks propagated either in an intergranular or in transgranular mode. The molybdenum content of this material was lower than the specified standard, which caused the elbow to be susceptible to pitting corrosion. Sulfur and chlorine were detected from the inner surface of tube and the crack surface. The cracks initiated from the pitting corrosion at the inner wall of tube. The residual stress from the repairing welding and the bending of elbow, coupled with the lower elongation compromised the integrity of elbow. The failure of elbow resulted from stress corrosion cracking. In order to avoid cracking of elbow in the future, the material’s quality should meet the specified standards. Weld repairs should be avoided. If it is essential to perform a weld repair, then stress relieve treatment should be used correspondingly.